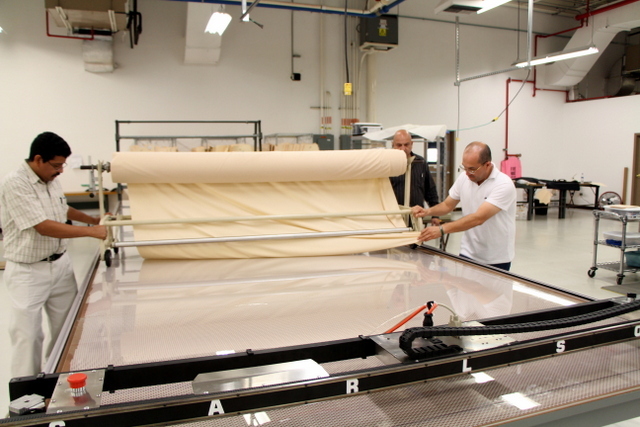 Jaime Muriel, president of Isavela Compression Garments, is passionate about textiles! 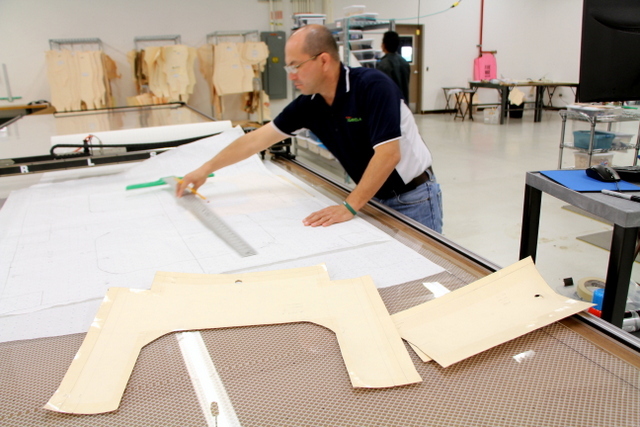 He uses a Carlson Design Plotter/Cutter to expand opportunities in the custom medical garment business. Jamie saves time by digitizing physical patterns, saves material by autonesting, and improves product quality and repeatability by computer marking and cutting. 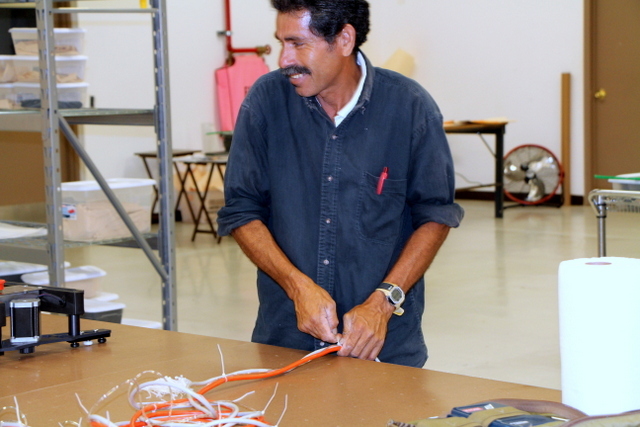 Jaime’s manufacturing experience began with his custom jewelry manufacturing business in Mexico in the 90′s. When it sold, he entered the Mortgage industry. But, his heart wasn’t in real estate, so before long Jamie was looking for a new project to get excited about. While exploring post-surgical recovery compression garments, he decided it was a niche he could passionately sell. When the industry players – now competitors – weren’t interested in his ideas, Jaime decided to produce his own. So, in 2008, he applied his manufacturing experience in Mexico to producing a high quality garment at the best price, and Isavela was born. 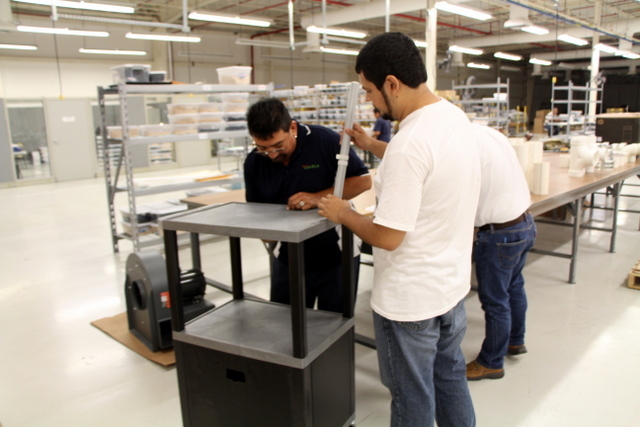 Seven years later, with headquarters in McAllen, TX and manufacturing in Reynosa, Mexico, Isavela have a 45,000sqft facility and over 100 sewing machines, all housed in a clean facility with cafeteria and air conditioning. 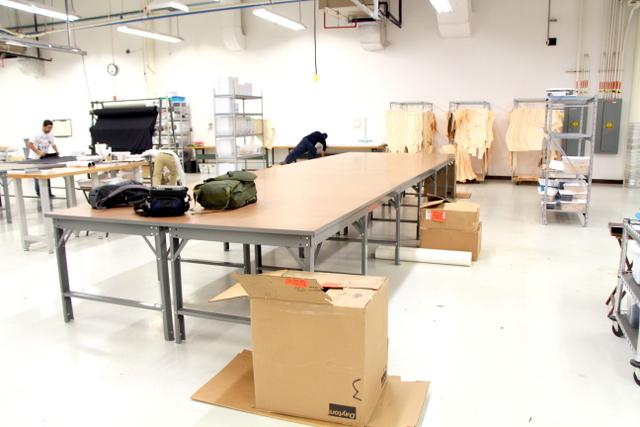 The high quality work environment and good wages ensure Isavela can provide a world-class cut/sew operation. Jaime Muriel, with his plant manager and plotter/cutter operator, gives a big Thumbs up! 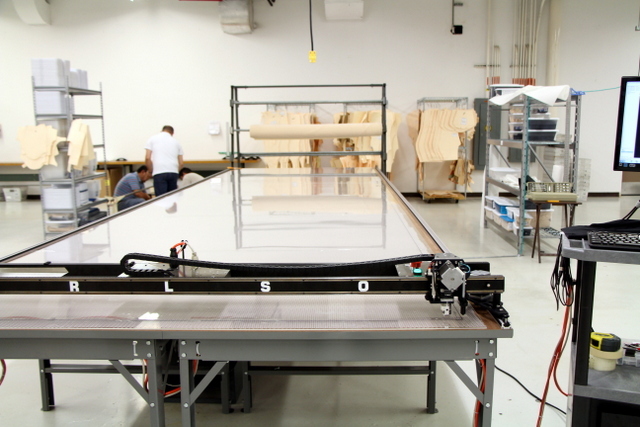 PT-84″ Plotter/Cutter on a 7’x24′ Phillocraft vacuum table, with a hard un-drilled acrylic cutting top. There are hundreds of pattern sets, each for a custom design. 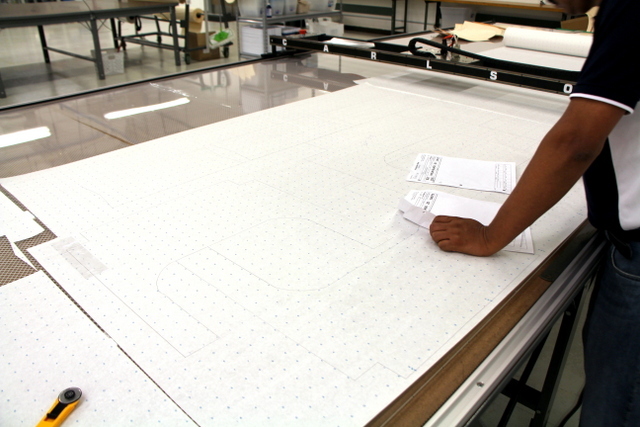 Pattern sets are pulled to order and traced onto pattern paper. Parts are manually nested. Material, templates, and weights are stacked for hand cutting. 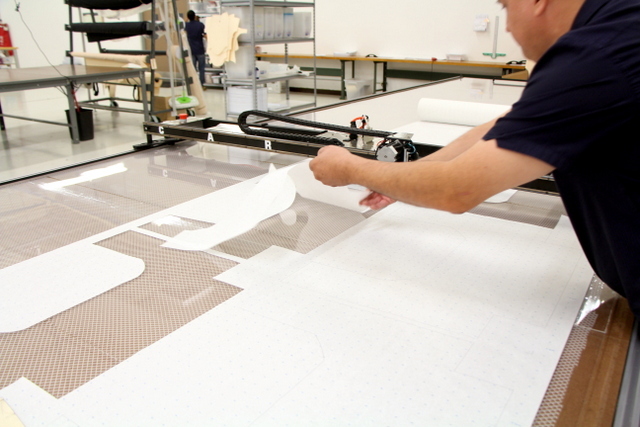 An electric rotary cutter is guided by hand around the pattern by a skilled operator. They have to do this for every order! The new technique calls for digitizing, organizing, and nesting patterns. 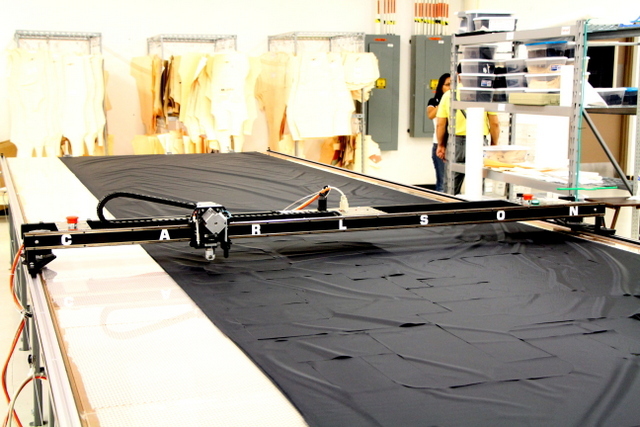 Using the Carlson Design T-Bar 2D Pattern Digitizer they can build a pattern library that allows the operator to quickly and easily retrieve and cut all of the patterns for a given job. 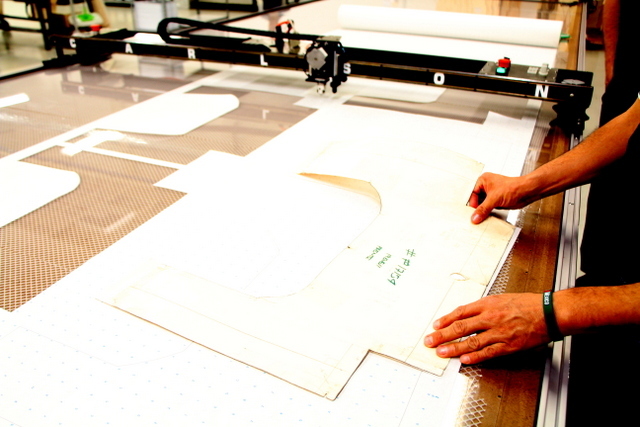 To begin digitzing, they pull a pattern set and confirm it contains the correct patterns. 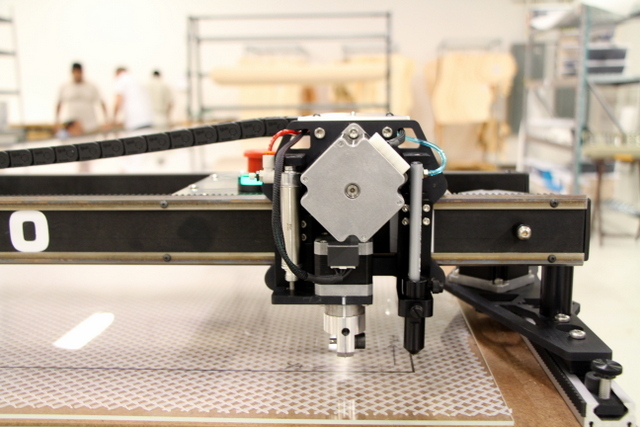 The T-Bar Digitizer rides in the same track as the Plotter/Cutter, providing a digitizing bed the size of the table. Before digitizing, it is important to secure your pattern with tape or even a clear sheet of plastic. Digitize by walking the T-Bar targeting head around the pattern and clicking the record button at significant points. 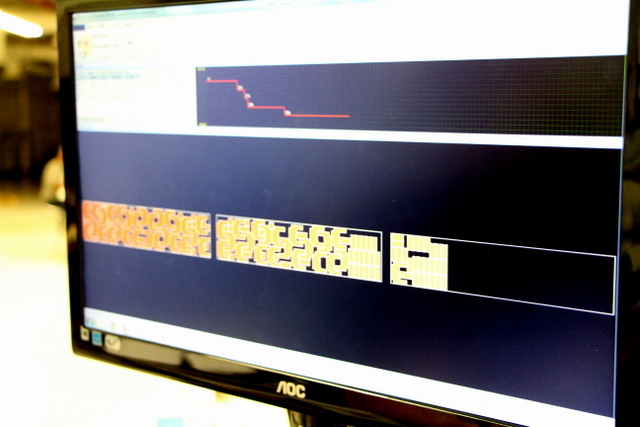 The pattern appears on screen in real time, in real scale. Once finished, parts are edited in Pattern Editor. Until the operator is comfortable digitizing, check the first few digitized patterns against the original. Jaime spreads patterning paper for our first test cut. Checking the results. Digitized patterns are often straighter and more square than the original — since you can easily create a straight line by recording only two points. The operator will quickly learn how to create the best digitized pattern with the least amount of data points. 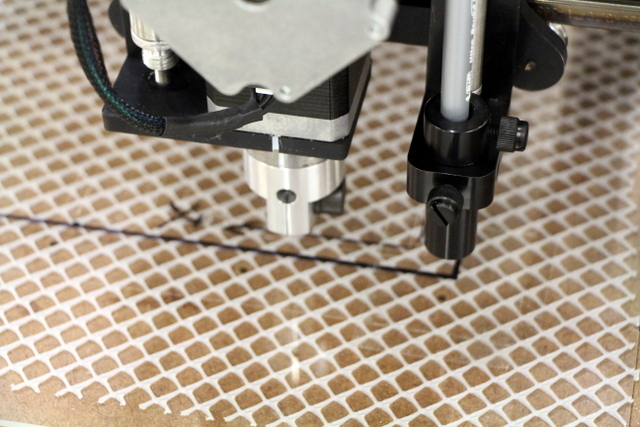 Our first digitized pattern cut in six minutes. To cut this pattern set again simply pull fabric, select the pattern, and click “PLOT”. Before Isavela purchased their Carlson Design plotter/cutter, they sent us patterns and material to test cut. 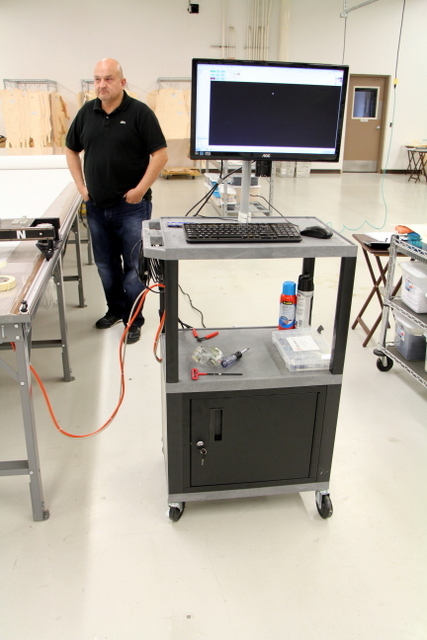 We performed two tests — the first was with vacuum and an HDPE cutting surface. 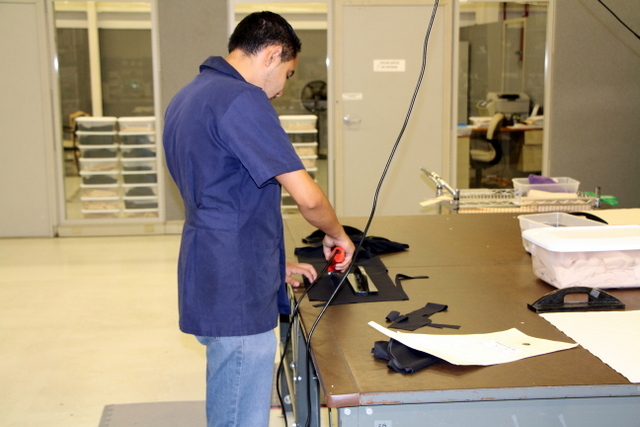 Since their knits – Trecol and Non-Slip Fabrics are porous, the vacuum is less effective in securing it for cutting. The vacuum holes in the cutting surface can cause an occasional material “hangers” if the blade rolls over them. The second test used a sheet of non-drilled acrylic, without vacuum. The acrylic is harder and its static cling reduces material shift during cutting and eliminates material hangers. 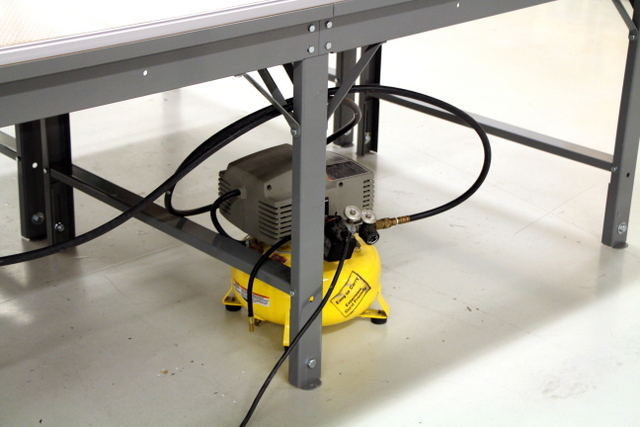 After much discussion, Jaime decided to order a vacuum table and blowers installed, but start with the non-drilled acrylic cutting tops. This means they do NOT use vacuum in their day-to-day cutting, but they could if the need or certain project arose. 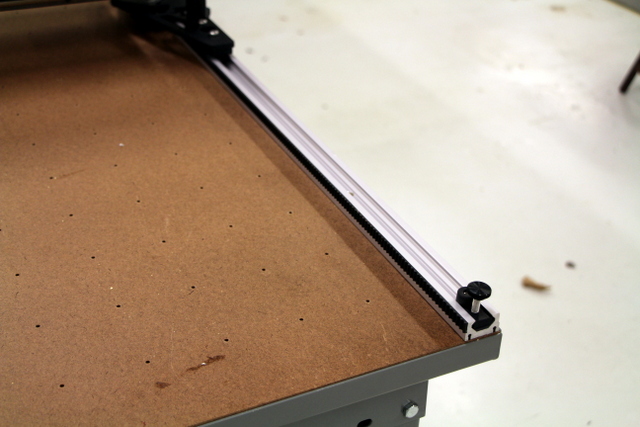 Isavela has everything they need for a vacuum table…except for holes in their cutting surface. The hard acrylic cutting surface eliminates material hangers. It’s also a little statically “sticky” which helps eliminate material shift. 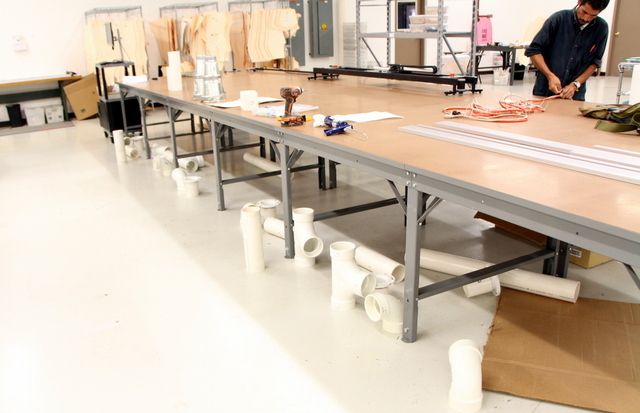 To convert the table to vacuum, they would hand drill 1/8″ holes in a 3″x3″ hole pattern in the acrylic top. To prevent dulling the blade on this harder cutting surface we more carefully regulate the pressure and slow cutting speeds around corners, further reducing material shift. 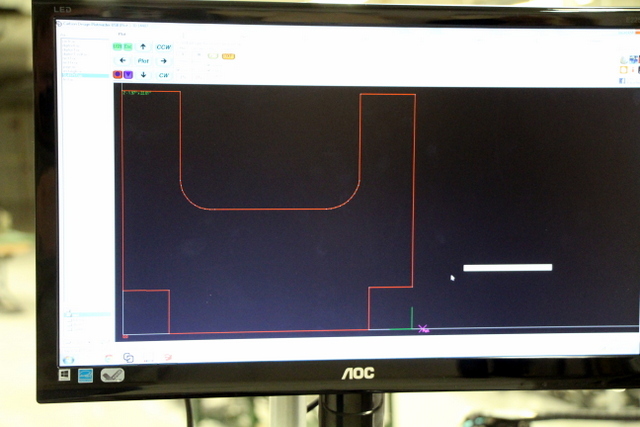 Digitized pattern sets are quickly and easily nested using our Autonesting software. Autonesting allows the operator to specify part quantity, orientation, and priority. Jaime reports the autonesting performs as well as the the original demonstration! Autonesting allows the operator to set part rotation, quantity, and priority. In seconds an optimal part layout is produced. To further maximize yield we can add patches with a low priority setting to fill any open spots. Setting part rotation parameters prevents the operator from improperly orienting a part. 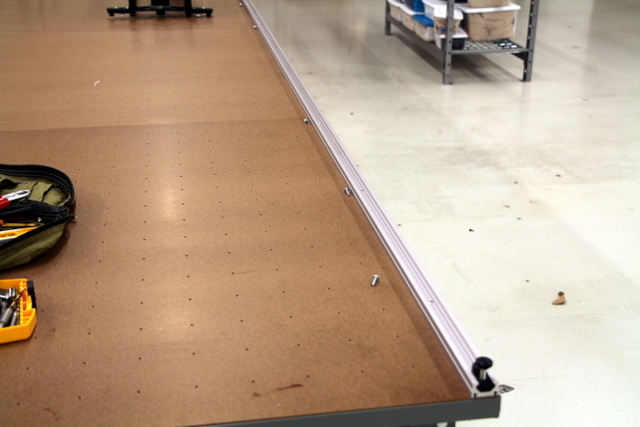 Autonesting also allows easy adjustment of part spacing. 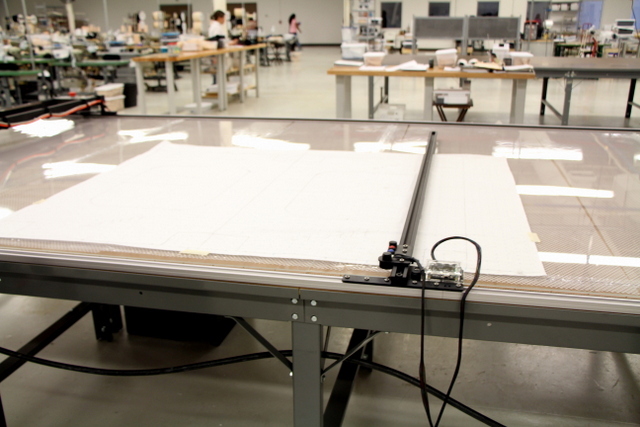 PT-84″ Plotter/Cutter on a 24′ long Phillocraft vacuum table. 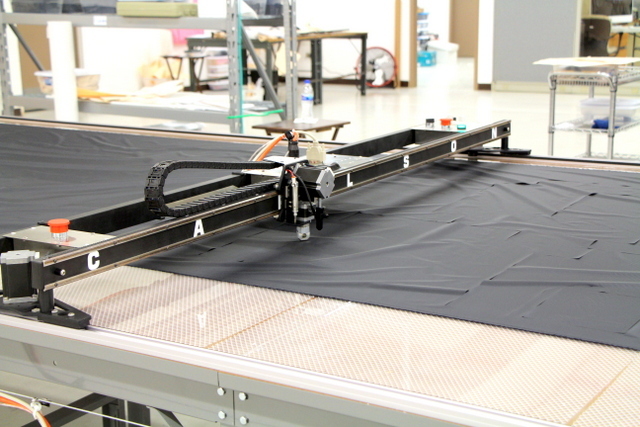 At 84″ wide, the PT-84″ Plotter/Cutter can plot/cut up to 74″ wide material. 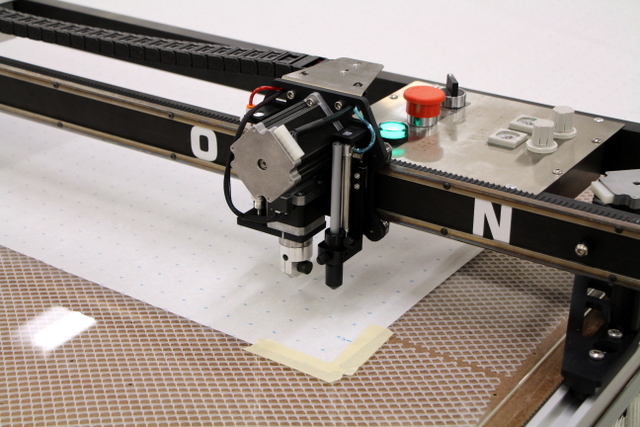 The PT-84″ Plotter/Cutter can still plot pattern markers for use in high-ply cutting. 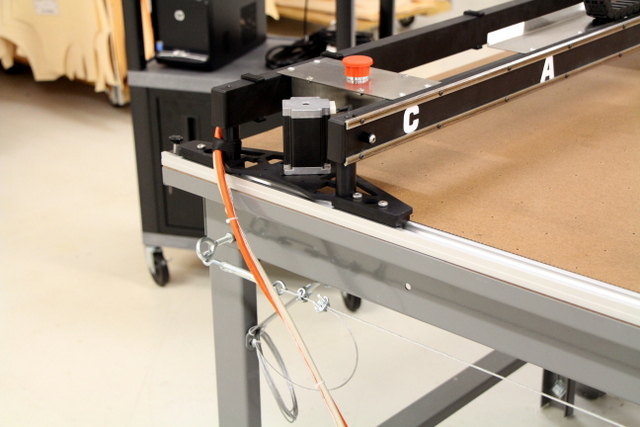 Below we review how we installed their PT-84″ Plotter/Cutter, vacuum system, cutting surface, workstation, and existing spreader. We also explore slits vs. notches in a short video at the end. 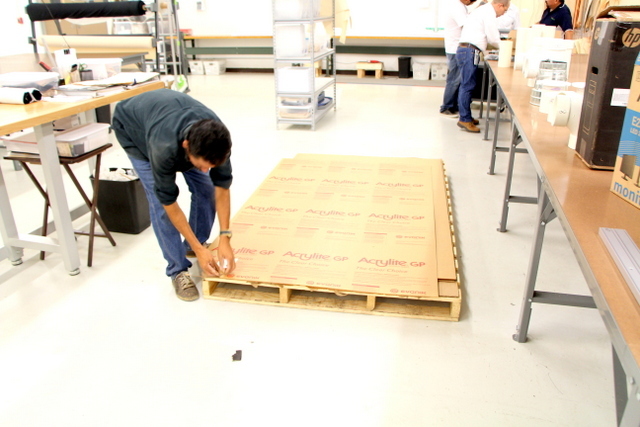 Isavela pre-assembled their 7’x24′ vacuum table prior to our arrival. This saves a lot of time, allowing us to focus more attention and time toward software training. Before continuing we check the table is square and level. 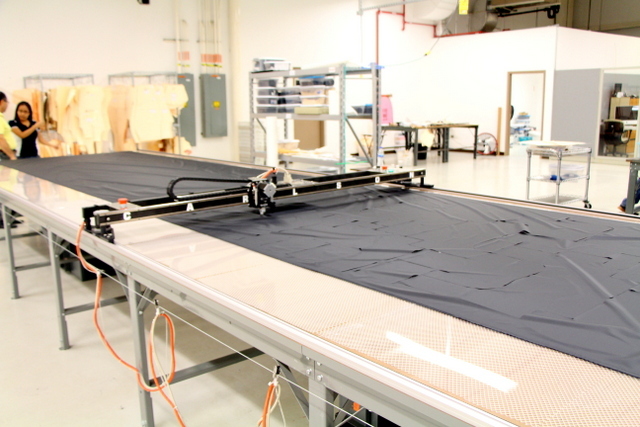 The surface is protected during shipping with a thin film on either side. Unpack everything, inspect for damage, and sort it with like items to make your install easier. Install track side A as straight as possible. 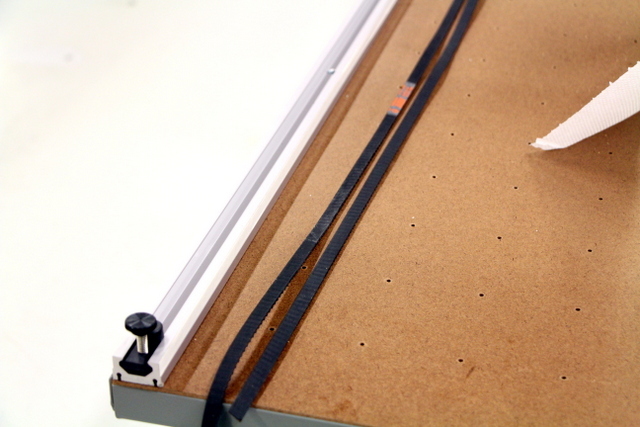 Use the Plotter/Cutter as a jig to align track side B. Mark, pilot drill, and hand secure screws for side B. Thoroughly rub down the back of the track belt with Acetone to remove grease before attaching to track. Apply double-sided tape to track and attach each side’s belt with even pressure. 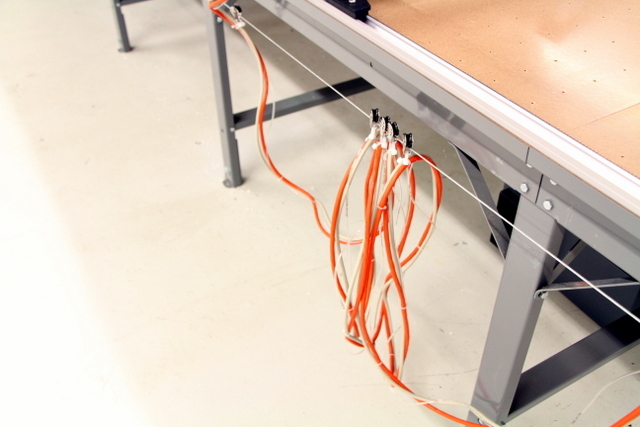 Ziptie control, air, and power cables together. Space ties every 2′-3′. Attach side-mount cable carrier wire. For tables longer than 24′, cables should run overhead. 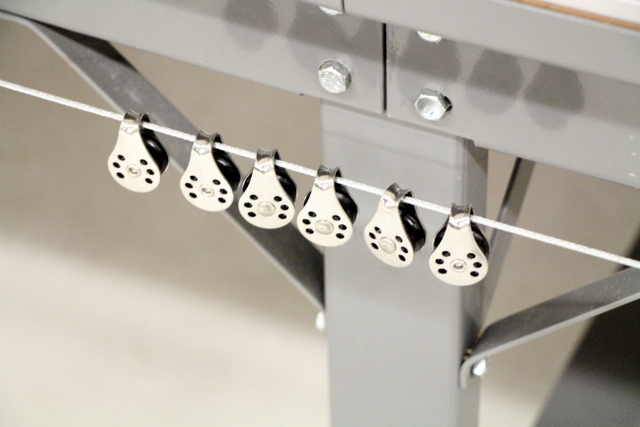 Use one pulley for every 4′-5′ of table. We recommend using high-quality sailing hardware. 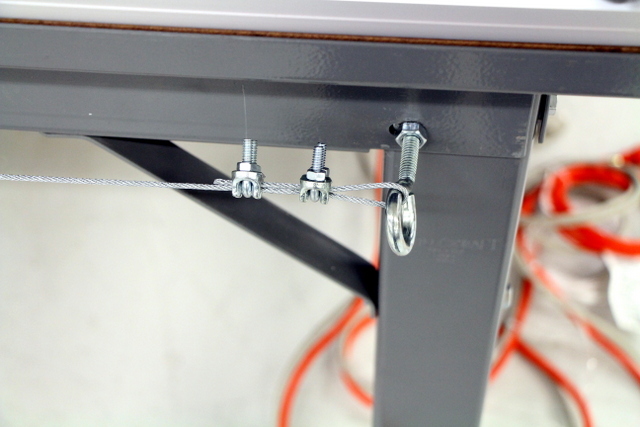 To determine cable drape, position the machine at the end of the table. The cable should drape about 2′. Zip tie cables to pulleys. Arrange plumbing in order. The front half of the table’s plumbing is labeled alphabetically, the back half numerically. 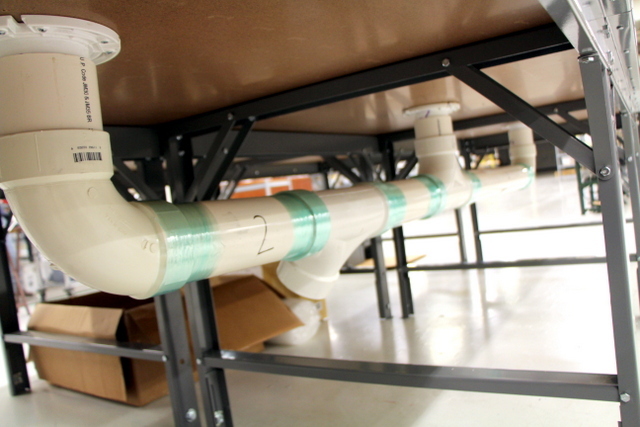 Attach plumbing to table. 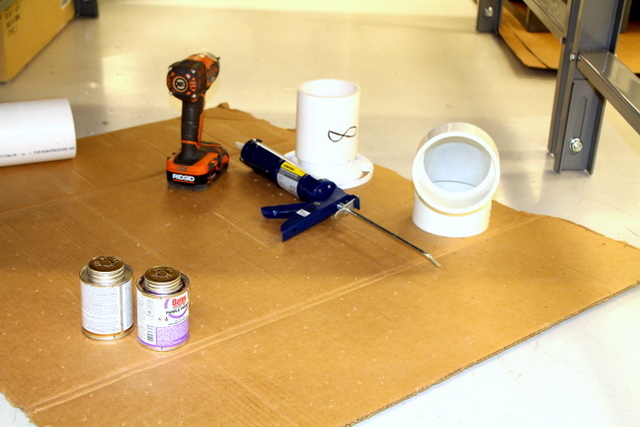 Use silicone sealant and #8 screws to attach flanges. All vertically attached pieces are PVC glued. 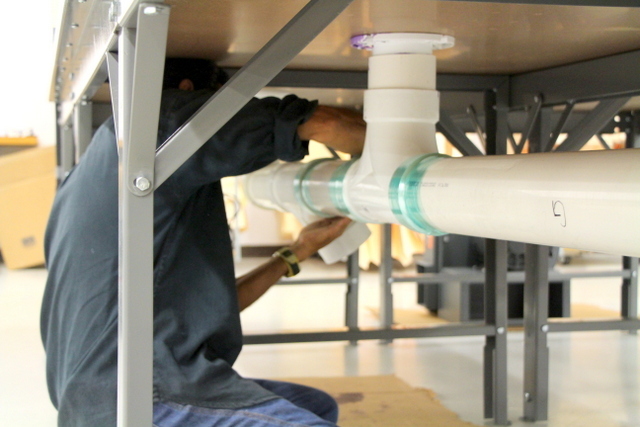 Horizontal plumbing is press fit and secured with stretch wrap. This allows for easy reconfiguration in the future. Plumbing is wrapped and sealed. Attach reducers to blower and connect the plumbing. Use #6 sheet metal screws to secure the reducers to the blower’s flange. Assemble the supplied operator’s workstation. Workstation includes monitor, lock-able box for PC and accessories, and wireless keyboard. 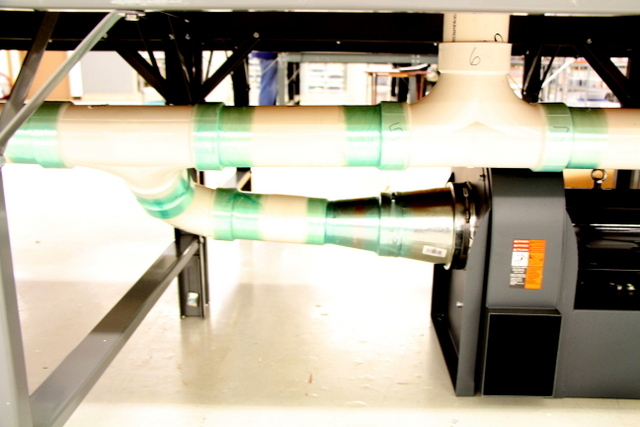 Connect the Plotter/Cutter to a source of compressed air (min 1CFM @ 90psi). We recommend adding an oilier and water separator, especially in high humidity environments. 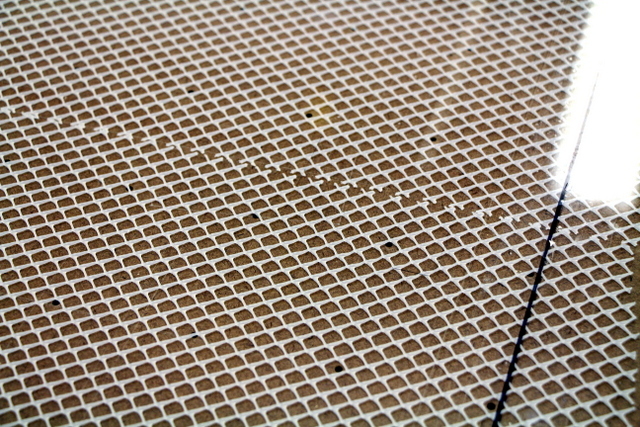 Vacuum breather mesh is run between the vacuum table and cutting surface, making hole alignment less critical if they convert to a vacuum table. Use the plotter/cutter’s Sharpy pen holder to mark some registration lines on the table. Cover the lines with clear packing tape. Take notes during training!! After training, leave a notepad near the operator’s workstation to record any questions as they arise. 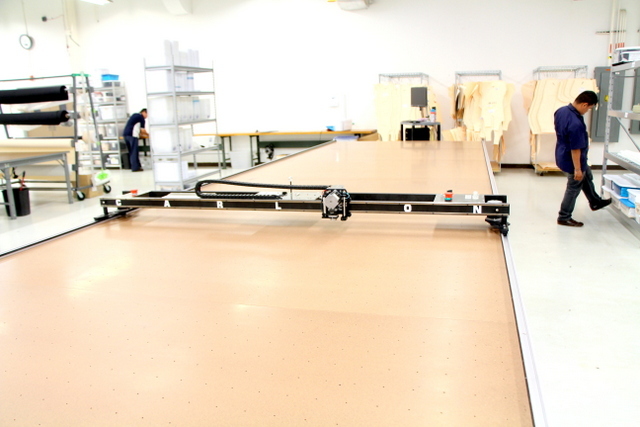 They were able to get their existing spreader to run on their new Plotter/Cutter table. Spreading is a very important step when cutting stretchy material. 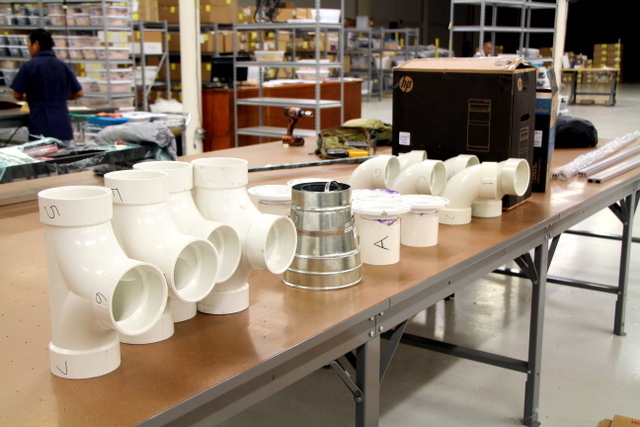 Slitting Vs. Notching: Notches are used to help the sewers identify how parts go together. Our steered blade holder can make V notches or slits. To reduce cut time, we recommend slitting the material with a short 1/16″ line. The over-cut of the 28mm rotary blade results in a 3/8″ long slit. We would like to give a big thank you to Jaime and his team for all their help making this an excellent install!